Like many people in technology-related careers, I have long searched for the perfect carrying bag. Ideally, I would like to have a bag or backpack that can hold a weeks’ worth of clothes, a full-size desktop computer and monitor, spare printer and paper, my camera and extra lenses, a full-size MIDI keyboard, and a small swimming pool, and still weigh under 2 lbs. when fully loaded. Needless to say, such a device has not been developed yet, so I keep trying various luggage-type devices to see how close I can get. 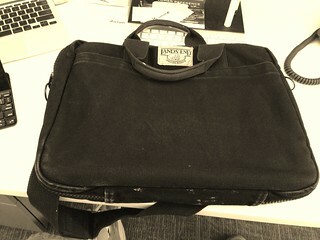 This is a Lands’ End Square Rigger attaché that I acquired around 1989. At that time in the remote past, portable computers did not really exist, and I used the case for mostly transporting notebooks, pens, and paper, to and from my work. When I finally acquired a laptop for work, I also acquired the first of many laptop bags. I don’t recall all the details, but I’m sure it was heavily padded and weighed a ton, because the laptop computers at the time were around 12 lbs. The Square Rigger was set aside, and a succession of laptops and their carrying apparatus followed, usually of ever-increasing sizes. Around 1999, I reached my personal baggage capacity. At that time, I was using a Lowepro photographer’s backpack. It could carry a full-sized SLR camera and 3-4 lenses in addition to the de rigeur 15-lb. laptop computer. At that time, I was commuting weekly to a job in Wuppertal, Germany, from my home in Ascot, England. I was seriously starting to have back problems, too. However, technology kept advancing, and laptops started to get smaller and smaller, and my later bags (usually backpacks) also started to get to a more reasonable size. In 2010, I acquired an 11” MacBook Air which was so light and thin that it wasn’t even considered a laptop by the TSA. The bag, however, was still fairly large. These days, I occasionally use the 11” MacBook Air, but I’m usually commuting with an iPad Mini. The other day, I ran across my 25-year-old Square Rigger attaché and realized that it was just perfect. I usually commute with the iPad and occasionally throw in some connectors, business cards, and, on rare occasions, the laptop. The velcro on the outside had worn out, so I went to a local shop that does alterations and had it replaced. No, it’s not heavily padded, but I can put the MacBook air in a padded sleeve when I need to carry it. While it doesn’t meet my description of the perfect bag (above), it’s amazing to me that the miniaturization of electronics has allowed me to bring these older artifacts back into play.